When moving a PDB between data centers, or from an on-premises environment to a cloud environment, all the data must physically move. 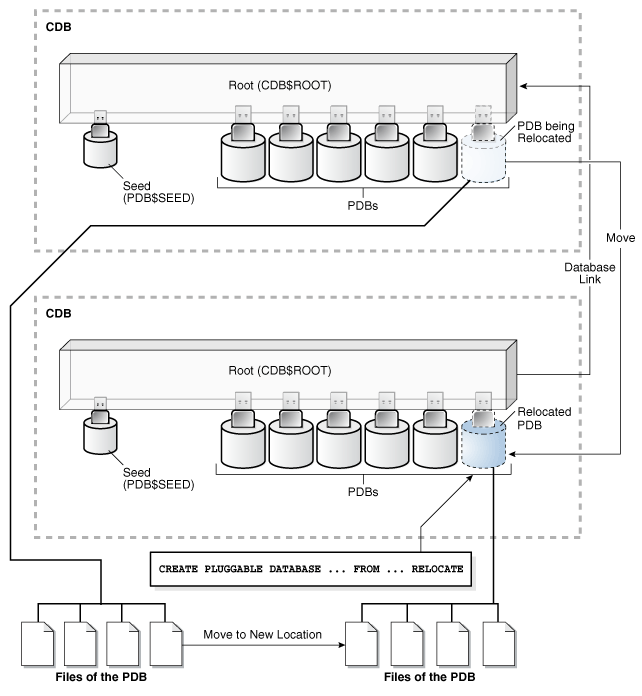 For large PDBs, this process may take considerable time, possibly violating availability components of an SLA. PDB relocation eliminates the outage completely. You can relocate the PDB without taking the application offline, changing the application, or changing network connection strings. PDB relocation executes an online block level copy or the source PDB data files, redo, and undo while the source PDB is open with active sessions. When the target PDB comes online because of an ALTER PLUGGABLE DATABASE OPEN statement, Oracle Database terminates the active sessions and closes the source PDB. 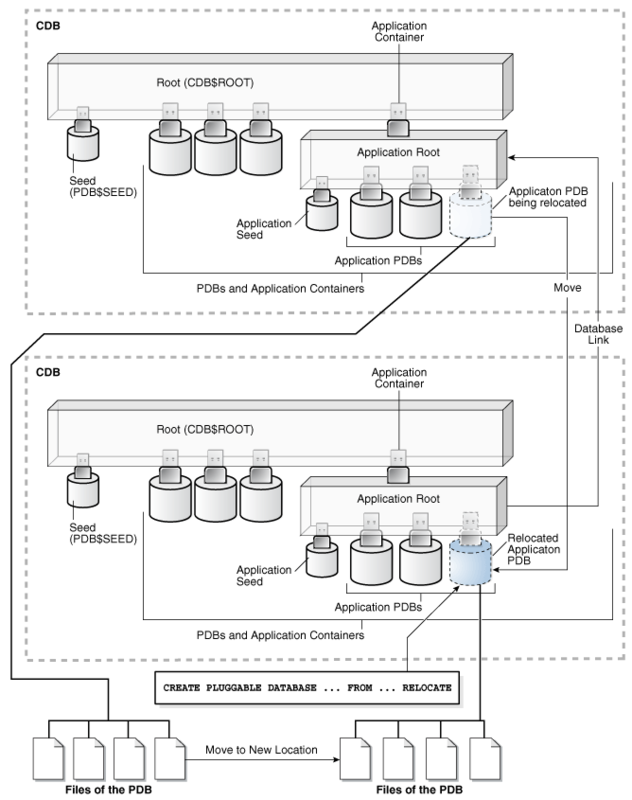 PDB relocation services are available in Oracle RAC and single-instance environments in which a PDB relocates between CDB instances in the same clustered database or between distinct CDBs. An example of finer-grained relocation in an Oracle RAC environment is service relocation between PDB instances. Oracle RAC and Oracle Clusterware offer a rich high availability environment that further minimizes the effect on connected clients during relocation. For example, shared storage may minimize or remove the necessity to copy data files. The user that the database link connects with in the PDB’s current CDB must have either the CREATE PLUGGABLE DATABASE system privilege or the SYSOPER administrative privilege. If the character set of the target CDB is not AL32UTF8, then the PDB’s current CDB and the CDB to which it is being relocated must have compatible character sets and national character sets. If the character set of the target CDB is AL32UTF8, then this requirement does not apply.